I was out of school for two weeks. Ordinarily, I would have been thrilled. But I was covered in these things from head to toe. Literally. I couldn’t play with any of my friends even after they arrived home from school or on the weekend. I was contagious. No varicella vaccine in the ’70s. My mother had to give me hot baths and slather pink calamine lotion all over my body. I’ll spare you the description of the boils. Ugghhh! Every time I even thought about scratching my skin, my parents warned me that I would have a scar in that spot. I was petrified. I remember sitting on my bed with my Holly Hobbie bedspread and sheets wondering what I could do all day. I had a walk-in closet that was just big enough to fit a desk and chair in. I would sit in there and read. I could close the door because I had a light in there. A lone light bulb with a string hanging from it. There was a full length mirror on the door. I would stare at my chickenpox reflection and my messy hair. Those suckers were on my scalp too. I was in my own little world. Momma and Daddy checked in with the school regularly, so I wouldn’t be behind when I returned. A few weeks prior, my class had been studying multiplication. I had worked on this at my desk in the closet many times. Daddy tells me that my class is now working on division. OMG! I’m going to miss division. My whole class is going to know how to do it and not me! Daddy calmed me down and said, “It’s just multiplication backwards.” Then he did some written exercises with me until it clicked and I felt comfortable with it. I practiced and practiced until I got it right. I couldn’t wait to get back to school and let everyone know that I didn’t miss a thing. Do you have a chickenpox story? Or a similar childhood tale? 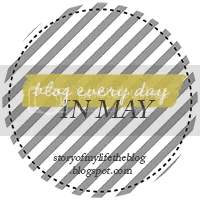 This post is forDay 18 of the Blog Every Day In May Challenge: Tell a story from your childhood. Dig deep and try to be descriptive about what you remember and how you felt. Funny the stuff we remember about our childhood. Thanks for commenting, Kate. Haha. I also got my chicken pox in fourth grade. The girl I sat beside on the field trip gave them to me. We were both out for the next week. Ugh, they were awful! Shingles! I don't think there's enough awareness about that. OHHHH. I remember that my brother went to bed with chickenpox and I woke up with them. ITCHY! Apparently it wasnt a big enough bout of it though as I managed to acquire shingles this year. Nasty. Thanks SITStah! I've heard about people getting them in their eyes. Wow! I even heard of people getting them in their mouth and throat. Thank goodness there is a vaccine now. I've heard about chickenpox parties! Ha! I think it's dangerous to get them while an adult. Hi Susanne. I started following your blog. Your travels all over the world look so interesting. Thank you for stopping by! I had Holly Hobbie sheets! I still have the flat sheet — boy, is it thread bare. But it still takes me back. I got chicken pox when I was thirteen. I even got them in my eyes. My mom put aluminum foil on the windows because the light hurt me so bad. About the age you're describing I got measles. I remember a big, ol' stack of multiplication worksheets that kept me busy, too. Luckily, I wasn't out for two weeks. Nice to meet another Holly Hobbie girl. Stopping by from SITS. I hope you have a lovely weekend. I lived in a neighborhood which was filled with kids. One of the kids got the chicken pox so our parents had us play together so everyone got infected at once and got it over with! Nice of your dad to sit with you and teach you division while you had to stay home.